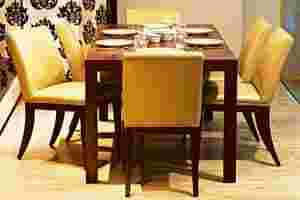 Dining table by Urbanist at Basix, MGF Plaza Mall, Gurgaon, Rs32,400. Because of its size, a dining table should be as simple as possible. This will ensure that it never becomes boring or monotonous: By simply accessorizing it differently, you can change the ambience to complement the cuisine being served. Add lights with dimmers to create different moods depending on the occasion. Colours for the room should be based on natural colours associated with food, from beiges and creams to citrus fruit colours, such as lime greens and lemon yellows.